Summer may feel like it just started, but families across the country are getting into fall mode as they prep their kids to go back to school. As the second busiest and most-expensive shopping season of the year, parents are looking at dishing out an average of $239 on clothing, $204 on electronics, $130 on shoes and $114 on school supplies this year. In fact, total back-to-school spending it expected to reach over $82 billion. Luckily, families don’t have to break their budget or go into debt to pay for school essentials. 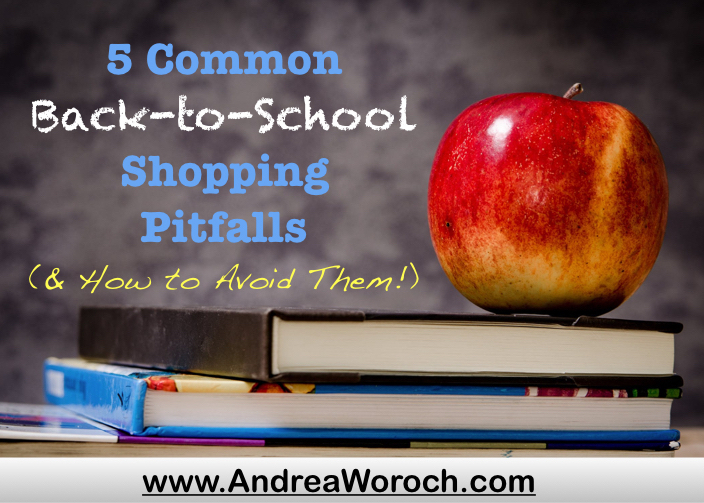 Just avoid these 5 common back-to-school shopping pitfalls to save money fast! Look around you home for school supplies your kids have left over from last year. You may be surprised just how much stuff you already have that you don’t have to purchase. This may include partially used notebooks, folders, binders, pencils. Check drawers, cabinets and your kid’s bedroom to see what you can make do with. Remember, you can always buy more later in the year when the items you have run out. Kids often fight with parents over name brands and while many retailers offer sales on these expensive products, you can save much more by opting for the generic or store brand version without sacrificing quality when it comes to basic school supplies like notebooks, binders, pencils. Many office supply stores have been promoting penny deals on store brand supplies such as 1-cent notebooks, 50-cent crayons and more. Even when it comes to the ink for all your printing needs, you can go off brand to save big! Sites like InksOutlet.com offer cheap ink & toner cartridges with remanufactured options that are compatible to your printer for up to 90% off brand name options. Plus, you can Save up to 75% on Compatible Ink Cartridges at Ink4Less.com. When it comes to the more expensive items including laptops, desktops, tablets and printers, search for refurbished options to save up to 75% off regular retail prices at Refurbees.com. You can also look for gently-used backpacks and sporting equipment for sale in your local community through sites such as Facebook Marketplace. Let’s be real—do you really want to splurge on a new gadget that your kid will just damage in a few months anyway? You can save more by selling your kids old sneakers, clothing, sporting goods or other items they no longer need or use to boost your school shopping budget. Back-to-school sales are heating up and spending a little bit of time shopping around can help you save more. Comparing prices doesn’t have to be time consuming either! Apps like ShopSavvy provide instant price comparison on your phone while the Invisible Hand browser tool will provide pop-up notifications when something you’re browsing online is sold at another site for less. Keep in mind, many stores will price match their competition so make sure you ask a store associate if they can match or beat the better deal you found so you don’t have to drive around time to shop around. You should also look for coupons online or on your mobile device, or sign up for a retailer’s e-newsletter to get exclusive coupons sent right to your email. Hold off on purchasing your kid’s back to school wardrobe—you can find better deals on fall apparel in late September when retailers begin lowering prices to make room for winter merchandise. October is the best time to snag deals on denim so look out for Columbus Day sales for even bigger savings. If you need something now, stock up on summer clearance items: The weather will stay warm for a few months while saving over 60% off. Retailers are constantly fluctuating prices and if you don’t monitor sales, you could overpay. Track price histories using sites such as RankTracer.com which will give you an hour to hour update on price histories of any Amazon sale and also allows you to set sale alerts. Sign up for a price tracking service such as Paribus which will alert you if something you buy online goes on sale afterwards and request money back for the price difference.